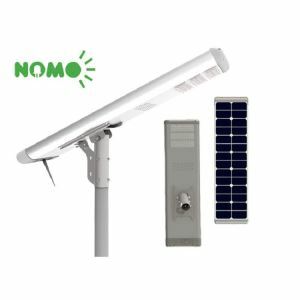 The design of the All in one solar street light comes from the inspiration and power of the universe, combined the best energy saving parts---solar panel, led lamp and special battery. With the help of the controller and PIR sensor, it realizes the functions of high brightness with low energy, long lifespan and free maintenance. At the same time, it is very convenient to ship and install. It is one of the best patent products of our company. “All in One solar street light” adopts the long life Lithium battery for storing energy, charging temperature at day time is between: -20°C～+60°C,when temperature goes lower than -20°C ,the control system will stop automatically to protect the battery, and it will revive to charge the battery while temperature goes higher than -20°C. Discharging temperature at night is between: -20°C～+60°C, any ambient beyond will take damage to the battery. So please check these factors while selecting the street light. ● Safe DC12 volt circuit, no risk of electrical shock. All in one solar light also be called integrated solar light, which means the solar panel、 battery、led lamps integrated one board. We focus on solar light over 8 years. Our company is subsidiary corporation of Commercial Energy Group, We are manufacturer of solar energy products over 8years with well-equipped testing facilities and strong technical force.We focus on solar products.We have two series Production which is Solar light and solar freezer. Our brand is “Newsky Power” which is well-known in solar industry.